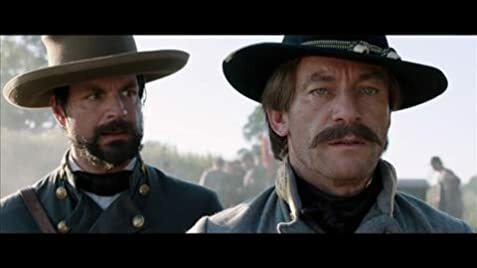 This movie was a good depiction of the events of the civil war, but I personally didn't agree with the tendencies of the directors during the movie. I somewhat liked the fact that love is expressed even in the middle of the bloodiest war in American history. It reminds us that we are all human; we are allowed to feel emotions of love, joy and happiness even during times of despair, death, and loss. Yes, people did have loved ones and families that they thought about when they went off to war, so it was an interesting movie to watch next to loved ones because it springs that thought of "what would I think if i were in that situation" into your head. Wilhelm scream: after Gen. Breckinridge says, "Go get 'em, boys." Virginia Governor Henry Wise is depicted as being opposed to slavery and secession. In reality Governor Wise was an ardent secessionist.